Since embarking on this hiding-the-veggies-in-his-food regimen, I have found that so many of these mom chefs are getting the nutrition in either by frying up the food with hidden veggies in oil or hiding the veggies in a dessert full of sugar. Both of which I was trying to avoid. I mean, once in a while is fine, of course, but not three meals a day or anything. 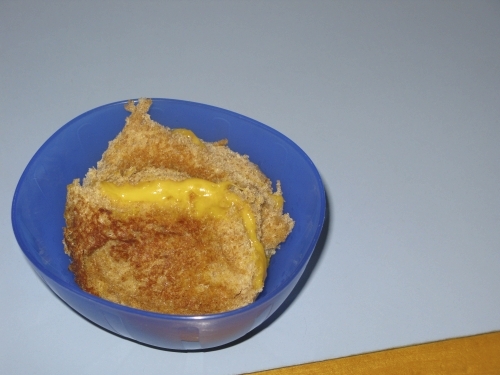 One recipe stuck out to me as a pretty good course of action, and I make it for Bowie nearly every day for either lunch or dinner: grilled cheese with veggie puree. It’s got several healthy elements, and kids tend to scarf it down, plus it’s super easy to make. And it’s even tasty for adults, because the veggie adds such a nice, creamy texture and a richer flavor to it. AMAZING with a bowl of tomato soup. 1. Mix the cheese and the puree together in a small dish. 2. Butter both slices of bread on one side. 3. Heat a non-stick skillet on medium low. 4. Place one slice of bread in the skillet. Place the cheese and puree mixture on top of this slice. Then place the other slice on top. Allow it to brown, then flip and allow that side to brown (a couple of minutes on each side). Transfer to a plate and allow to cool. *To make carrot puree, peel carrots and cut into 3 inch chunks. Steam for 10 to 12 minutes. Puree in a blender or food processor, adding water if necessary. Carrots are a great source of beta carotene and fiber. To make sweet potato puree, cut whole sweet potatoes into quarters (leave peel on). Steam for 40 to 45 minutes or until easily pierced with a fork. Alternately, leave them whole and roast them at 400 degrees for 50 to 60 minutes. Scoop the flesh from the peel and puree in a blender or food processor, adding water if necessary. Sweet potatoes are a great source of fiber, beta carotene and antioxidants. Purees can be stored in the fridge for a couple of days, or can be frozen and stored for several months. I freeze the puree in ice cube trays so I can easily pull out small amounts at a time (great technique if making your own baby food too!). You could use other veggie purees if you have them, but for this recipe, the carrot and the butternut squash have a creamy and mild enough flavor to blend right in. You are such a dedicated parent. You make me proud!